Today's manicure is inspired by the punk skulls and painful piercings of punk rock culture (or at least how it's embodied in my mind). Born Pretty Store, the well-stocked e-tailor of fashion accessories including a huge variety of nail art supplies, sent me a set of rhinestone studs and gold rings. They roll together in a nail art wheel, and the rings can be pried apart to pinch around the tip of your nail, faking a pierced look. I wouldn't actually wear these anywhere, but I'll wear them for the art of the look! I hand painted the skull (using this design as a guide) using black polish and a tiny detailing brush I picked up at Sally's. The neon polish underneath is OPI's new one, Life Gave Me Lemons. 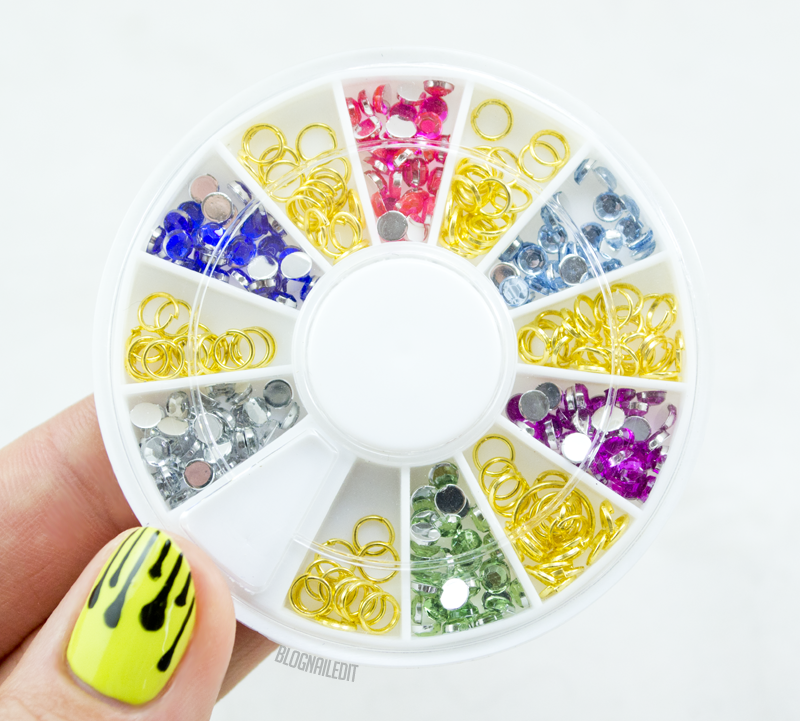 This nail art wheel is available for $3.95 from Born Pretty Store (10% off with my coupon code C10X31), and shipping worldwide is FREE! No excuse not to give it a try. What do you think of the punk rock rings? Are they too impractical for you, or would you give them a try sometime? I know I certainly couldn't regularly rock them, but might pull them out come Halloween! I like the rings with the rhinestones! That's kind of a cool, funky look. The piercing… not something I could rock! Definitely agree with Hannah - the rhinestones with a ring round them look awesome - kind of like a flesh tunnel but sparkly! I'm not certain about the "pierced" ones, but I think I'd try it as a one-off.